The United Nations’ International Day for the Elimination of Violence against Women is an occasion for governments, international organizations and non-governmental organizations to raise public awareness of violence against women. It has been observed on November 25 since 1993. This is by far the largest effort by men across the world, working in partnership with women, to end men’s violence against women. I have a close friend in Arizona, who has been married about 4 years. Let me premise this by saying that she is exceptionally intelligent, at one time holding a very high paying job in the corporate industry, has a sweet personality and is eager to help others. Does she have faults? Absolutely, but we all do. Since that time, her husband has cheated and when caught, told her she was making it up, was crazy and needed mental help. He has lied on her to his family and friends ruining her reputation in a neighborhood she's lived in for over 12 years without incident. He tells her she looks like a bulldog and is strong enough to lift a car. He is easily angered, yelling for no reason, demeaning and degrading her character both publicly and privately, using profane words, assuring her it's all her fault that he speaks the way that he does. He withholds funds after she's paid bills, telling her she doesn't have a real job and because of her he can't purchase things for himself. He says he can't stand her. He has lied about so many things, that she can no longer really count on anything that he says. She's tried to tell him she's afraid to talk to him, yet he minimizes her feelings by saying he doesn't hit her, so why is she afraid? Her clothing is dowdy, he won't introduce her to friends, and insists she do all the work around the house despite both of them working. When she's submissive he yells, when she tries to exhibit assertiveness, he loses his temper. Everything that's wrong is his life is her fault. Make no mistake - this is Abuse. To say that this man is absolutely gorgeous would be an understatement, and he is super handy around the house. Add to that his fabulous sense of humor making most people feel immediately comfortable, and you have a real life romance novel hero . There are even some days, she says, when he is unbelievably kind, making her doubt her sanity; yet smoldering beneath the shiny exterior is a ticking time bomb waiting to explode. She is still beautiful, has gained some weight due to her sadness, grown reclusive and is now a shell of her former self. Why won't she leave, you ask? Mostly she's afraid of being alone, no financial stability, not being accepted and believing that she doesn't deserve any better. What hurts me is that I've been listening to this for a while and she is too far away for me to hug, and he won't allow her to visit. I can remind her that she's not alone and help is available. There is still hope. This is just the tip of the iceberg, and many of you may be going through even worse situations. If this is a day in your life, please know that it's not your fault. Someone who loves you will not humiliate you and subject you to needless pain. 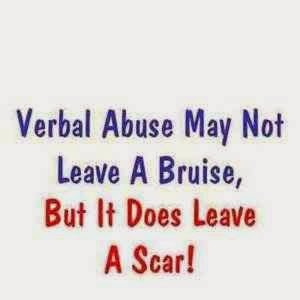 These instances are examples of verbal and financial abuse designed to intimidate and manipulate, eventually effecting your self-esteem and emotional well being. Please seek help or guidance when you safely can, and know that there are plenty of people in your corner wanting to offer assistance. It doesn't matter what state or country you're in, I'm here to listen, cry with you, and hopefully provide valuable help. You are beautiful in every single way, and you deserve the best. Please don't give up!